It's New Year's Eve and I know that everyone is busy preparing for the celebration that is to come a few hours from now. As I also plan on what to cook for our New Year's celebration here in Germany, I remember the many traditions that we had when celebrating the coming of the New Year back in the Philippines. It makes me nostalgic about it but reminiscing those days makes me smile and even chuckle. 1. 13 round fruits to be shared by everyone. It is said that the 13 round fruits will bring in good luck, maybe because fruits are healthy and if you eat them all year round, you won't easily get sick. Makes sense, right? 2. Firecrackers to start the year with a bang. It is a belief that lighting up firecrackers on New Year's Eve will help ward off the negative vibes. But because they are dangerous when handled improperly, many would just opt to turn the volume of the speakers to maximum and make any noise inside and around the house imaginable. Don't forget to sound the torotot too, a local horn made of paper and bamboo and plastic film. 3. Wear polka dots to welcome the new year. The bigger the dots, the better because it means more money for the New Year! But shouldn't we make it checkered stripes instead? Dots means coins and the latter means notes. Which do you prefer? The notes of course! So it better be checkered stripes! Lol! 4. Throwing of coins for the children. It is a symbol of sharing your blessings to others, especially to those who have less than you have. It is always a good idea to share your blessings to others, no matter how small, because they will come to you a hundred fold. 5. Round dishes on the dinner table on New Year's Eve. Keso de Bola, Pear-shaped or Ball Ham, round shaped cakes, and other dishes placed in round containers. Aside from the circle being a symbol for money, the circle is also endless and perfect. The belief is that the more you have on the table, the more bountiful and prosperous the year will be because the blessings will just pour. There are countless others. But these are the significant ones. Whether you believe these or not, what matters most is that you always do what is good, you give your heart and best in every endeavor, and you never fail to give back and share to others for all the blessings that you have received. I wish everyone a Happy, Healthy, Prosperous and Peaceful 2011! May God bless YOU more! Our current house will always be an ongoing project for us. There is still a lot of work to be done in this two-bedroom flat, one of which is our very spacious balcony. See the photo below? It is very wide, boring, empty and bare, right? It could really do some improvement, or an overhaul perhaps? I know that lots of creativity, a little planning, some Kichler outdoor lighting and of course, some money, will do the trick! I have always dreamed of creating my very own balcony garden and I can already imagine how it will look like: some wooden flooring on one side, a small water garden with some tiny fish, greens here and there, some orchids, garden furniture, and voila! I really want something that will evoke that relaxing and natural feel and a balcony garden like the one in the photo below is just what I want! Isn't it just the perfect little haven especially in the summer? This would really be the perfect place to relax and chill out after a long day at school for me and a long day at work for my hubby. I know I should start saving up if I want to create my very own balcony as in the picture above. And I must find the right garden furniture too. Hello Couchers! I am as always late for this week's edition of Tuesday Couch Potatoes. I am beginning to doubt whether I should just end it this year or not. What do you think my dears? Anyway, this Tuesday's theme is New Year's Eve Movies. I must admit, there aren't much movies with this theme compared to Christmas themed ones. So if you can't find any, a Christmas-themed movie will still do. Anyway, my pick for this week will be When Harry Met Sally, a 1989 romantic comedy starring Billy Crystal as Harry and Meg Ryan as Sally. It's really a nice movie that explores the question: "Can men and women ever just be friends?" I think you ought to watch the film to find out what happened in the end! But I guess it is quite obvious. Thank you for joining us here on Tuesday Couch Potatoes. Here is wishing each one and all a very Prosperous 2011! And because 2011 is the Year of the Rabbit, our theme next week will be Rabbit/Bunny Movies. Hope to catch you next year guys! Enjoy the New Year and God bless you more! In life, we get to experience a myriad of things: some strange, some beautiful, some worrisome. And as with all things, there will always be a first. Growing up as a child, I remember going to first grade, meeting my first friend, receiving my first communion, even having my first crush. As a teenager, although I am not specially good at anything, I realized for the first time what my potentials really were. As a young adult, I fell really in love and met my first (and last) boyfriend, got my first job, earned my first pay check, got to facilitate my first high school recollection, and lots more. I thought that I have already experienced all the firsts that one has to experience in their lifetime. Then I got married and did my first travel overseas. Then I became a Mom. And the firsts seem to flood and overwhelm me. I had my first pregnancy and everything that followed after I had my baby seemed to be a first! I am fortunate to have been there and to witness my firstborn's firsts: the first smile, the first crawl, the first steps, the first toy, the first pair of shoes, the first words, the first birthday, the 1st birthday invitations, the first day in Kindergarten, the first friends she met, the first song she sang. And I know that as a Mom, I will experience more firsts with my little girl. I just hope that I will be able to always make myself available each time she needs me so that I don't miss on the firsts. I always believe that handmade crafts last longer than those that are mass produced. Because they are handmade, no two pieces are different and it takes longer to make them. Most handmade craft is an art in itself so that one can expect them to be a bit pricey than the usual commercial version. I have always wanted to do handmade crafts but time does not permit it. I am very much attracted to furniture design and have always wanted to design my very own mosaic glass tile table. Have you ever seen those colorfully designed coffee or dining table tops? They could really help brighten a room and they also could make great conversation topics. Your guests can't help themselves but ask, "where did you ever get this one?" It makes me wonder when I would find the time to make my very own mosaic glass table. But I know, one way or the other, I'm gonna make one! All I need to do is create a design, look for tiles that will be perfect for the mosaic, buy a new dining table and work on it. But when? One never knows... I guess I will just have to write this down in my "bucket list" lest I forget all about it. I know this is a late entry but I just had to wait until we had our Christmas party last Friday to post this one. As a parent, I know how important Christmas is to children. My parents have made sure that we get to experience the joy of Christmas, even in the most simple way. They give us something that we need, like new clothes, and we always share Christmas dinner. We also have exchange gifts, so that we learn the value of giving to others and sharing what we have and the feeling of being loved because of receiving them. Checking out the gifts under the tree with her friends. My little girl now understands the concept of gifts but she sees a gift as something that is for her, and wrapped in a gift wrapper and tied with a ribbon. So I had to explain to her that not all gifts are for her, that she also must share and give gifts to others. I bought some gift items one day and then I showed them to her, some already wrapped and some, I had to wrap myself. She wanted to open all of them at the same time so I had to explain to her that it is not hers. They belong to someone else. I explained to her that because it is Christmas, she will share gifts with her friends. And then I asked her to help me wrap the rest of the items that she will give to her friends as small gifts. She seemed to understand because she didn't make a fuss. And my, was I overwhelmed at the Christmas party because she received more than what she gave away. The best part of it all was the wonder and delight in her eyes upon seeing Santa Claus and receiving her gifts! I used to love and have in my possession techie gadgets, especially the handheld games. I remember working hard just so I could earn some extra money to purchase them. More often than not, I find myself in gadget shops in the mall, watching out for new product releases and scouring for the best deals before finally buying one. I guess my fascination for handheld game gadgets started when I got my hands on a brick game. I could go pushing the buttons all day and night just to beat the current high score. Then came the other handheld game consoles. I even remember the Tamagotchi, a handheld digital pet, which was so popular in my teens that almost everyone has them! Now that I am older, my hands are being kept busy with household chores and blogging that I have less and less time and interest for computer games. But if I were to receive a psp for Christmas, I wouldn't mind at all! I think I can still manage and afford to go piu-piu-piu all day now that the winter break is fast approaching.I must confess, my hands have been itching to get their hands on one. And if Santa could read my thoughts, I know that he would make sure that I get one for Christmas. Birtdhay wishes goes to a great Mom who has managed to keep a balancing act between being a teacher and student at the same time. I think you are doing great at homeschooling Kyla Marce Chris and I know she feels the same way too. I admire for being able to inspire other Moms and for living your Christian values and passing them on to yourself. May God bless you more this year and the years to come! A very Happy Birthday Marce Chris! 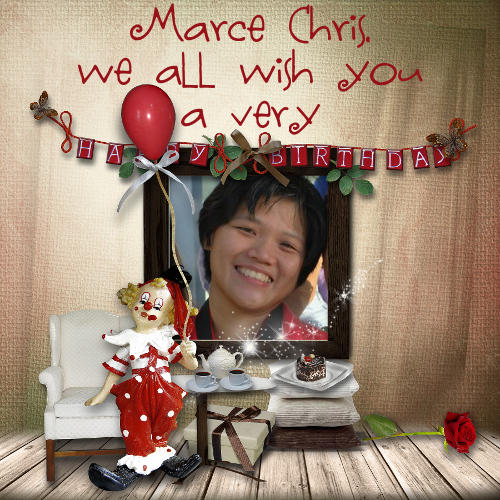 If you know Marce Chris, do visit her blogs below and give her some birthday love! What is RFID? And why is my post title written in this manner? I absolutely had no idea what RFID is until today and I realized that it has been around for more than fifty years, a technology which was once limited to tracking cattle and is now tracking consumer products all over the world. RFID or Radio Frequency IDentification is a technology that uses communication via radio waves (also known as electromagnetic waves) to exchange data between a reader (a device which interprets the radio waves sent by the RFID tag) and an electronic tag (The RFID tag) attached to an object, for the purpose of identification and tracking. Quite technical huh? Although this technology is very promising and is foreseen to eliminate long lines in grocery stores and airports, there are also some entities who would take advantage of such a technology like the electronic pickpockets. We all know that the new credit cards and e-passports today contain tiny two way radios called RFID chips. Because of this, millions of us are prone to electronic pickpocketing, because these thieves can just scan our credit card numbers and other personal information without making physical contact. It would be such a horror to find out that you have maxed out on your credit card limit without you even purchasing a thing right? To stop these electronic pickpockets, we need to arm ourselves. We need to protect our credit cards, electronic passports and other ID cards by blocking the data/information contained in them. How? You would need an rfid wallet for that.With RFID or contactless technology, identity theft and electronic pickpocketing has become like a stroll in the park. And everyone who holds a credit/debit card is at risk! Would you risk it too? It's a rather cold week this week. The weather forecast says that it's gonna snow the whole day and that it's going to be colder than the previous week. The cold feels so intense maybe because all of us in the house are not feeling well. My husband and I have the colds and my little has been sneezing and coughing for quite sometime now. Going out of the house is quite a task especially if you have to walk in the icy, cold weather and you could just feel as if your nose and ears freezing. It would indeed be a great comfort to come home to a warm home, and lie in a bed that has heated mattress pads, because it would be like you are nestled in a warm cocoon. I have no choice but to drag myself out of bed today and move. I was already absent from my classes yesterday and I must attend my class today. I cannot allow my body to give in to the illness that has befallen me, otherwise my little girl will get sick too. Furthermore, I need to know from my classmates what I will prepare for our class Christmas party tomorrow. Even my husband, who has not been feeling well since yesterday, dragged himself to work today. So on my way to school today, to feel a little less cold and a little bit warmer, I will think of the chirping of the birds, I will imagine the snow melting and things coming to life again: plants and trees growing back their leaves, squirrels and rabbits coming out from their hibernation, the sun coming out and feeling warmer to the cheeks. Isn't it nice to experience the difficulties and the coldness of winter in order to better appreciate the next season that is to come? In less than two weeks, we will be celebrating Christmas. I know everyone is busy with Christmas parties and gift shopping among other things. And I bet each one is expecting to receive some lovely surprise from Santa Claus this year. But before we dig in, let's enjoy our share of movies for this week's theme: Santa Movies here on Tuesday Couch Potatoes this week. My apologies again for posting very late this week. 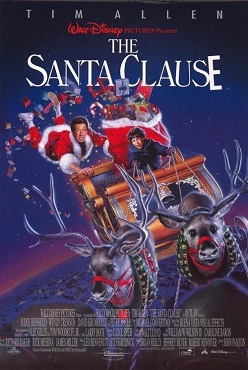 My pick for this week is the movie The Santa Clause. What would you do if something bad happened to Santa Claus on Christmas Eve? You would definitely go on a panic right? Who would give the children their gifts if Santa cannot make it? 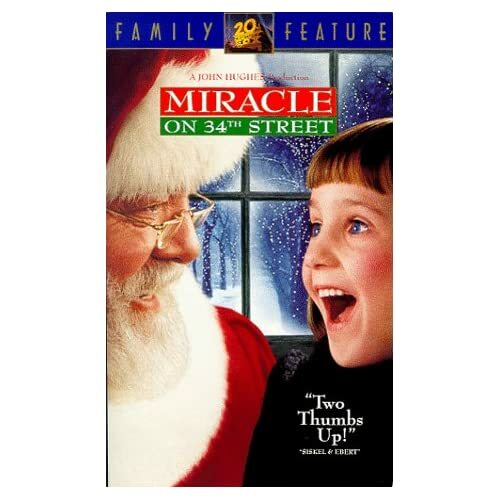 I guess this movie explored that possibility and the result is a very funny yet heartwarming tale of a man who doesn't believe in Santa Claus until he was forced into the situation to become Santa Claus himself. With Tim Allen leading the role as the new Santa Claus, this movie is one great way to spend the Christmas Eve with the family. Thanks for joining us this week Couchers! Our theme next week will be: A Family Christmas, movies about families celebrating the Christmas season. Hope to see you again next time. Take care and Happy TCP! A new LCD TV for Christmas? Not bad! It would just be perfect as a Christmas gift, don't you think? My husband has been looking for television sets on the internet including those from Sony and he has been comparing the many options and features available. Our TV rack is well on the way. It is scheduled to be delivered this Friday. The only problem is that we don't have a TV set yet. Our internet socket is in another room, and it is very far from the living room and our media receiver and network connections are in that room. So I guess we will be needing HDMI repeaters that can extend up to a 100 feet if we want to enjoy internet TV and high definition shows. Good thing there is HDMIrepeater.org that sells just these stuff. An HDMI converter is out of the question because most of the commercially available TVs are now HDMI ready. I am excited to get our own television set. I wish though that we could get it sooner. You see, we have been using our desktop monitor as a television screen if we want to watch a movie or a television program and it is not so exciting because the screen is small. With a 40 inch LCD TV, the experience will be very different. I had my hair cut short in the summer because it has grown too long and I have been having some hair fall problems. Now that it is winter and cold, I am starting to miss my hair. I wish I could grow it back as soon as possible while it's still winter time. Do you know of any hair care products that makes it possible for a faster hair growth? Oh yes, I want to get longer hair but I also don't want to have hair fall problems again. So I am taking precautions. 1. Eat protein-rich food like milk, egg whites and fish. Hair is made up of keratin, a kind of protein so the more protein you consume, the more hair you can grow. 2. Don't let the fact that your hair is falling out stress you. Stress is one of the main causes of hair fall so just keep your cool and keep a calm mind. 3. Take biotin, Vitamins C, D, A and B and minerals like potassium. These are the best hair vitamins that will keep your tresses intact and strong. 4. Smoking, drinking alcohol and caffeine are generally not good for your body. So if it is not good for your body, it must also be not good for your hair. 5. Get a regular exercise so your body will sweat. Sweating helps clean and unclogs your hair pores. 6. Avoid any rough treatment to the tresses. Unnecessary brushing, combing, heating or handling of your mane will weaken the hair at the root level and cause hair fall. 7. Cut off all split ends to allow your mane to grow healthy and to prevent further damage. A trim every eight weeks will be enough to stop the split ends from infecting other newly grown tresses. 8. Keep your hair moisturized by having a hot oil treatment once in a while. If these won't stop the hair fall, then there must be another reason why your hair is falling out. Then this is the best time to consult your physician. Anywhere in the world, we hear of news about thieves and criminals breaking into houses, or women feeling unsafe and getting stalked, or children being abused by their babysitters. If you have a family, of course you would like to keep your family safe from these bad people. You would provide all the security possible in your home. You see to it that you lock the doors and windows securely so that no entry is possible. You do not just open the door whenever somebody rings and peep first through the peep hole on your door. You even install hidden cameras outside your door or on your foyer or terrace so that you can monitor if somebody is lurking about your house. Our apartment, although it doesn't have surveillance cameras at the main entrance has security features too. The main door can only be opened if you have a key or someone from the inside opens it for you. Doors to the units have peep holes and double locks to ensure that the doors are locked securely and to prevent break ins. The police even makes a regular surveillance in residential areas especially if there have been threats and calls for observed unidentified persons lingering in the streets. If the life of a human being is at take, it is always best to take precautionary measures. It is always better to be safe than sorry. I have been reminding my husband time and again to have the steinschlag (stone chip) on our car's windshield repaired. There is now a technology that will repair these small stone chips on your vehicle's windshield that takes only about thirty minutes and is usually covered by your car insurance. The costs would still be covered by the insurance since the chip was caused by natural means and we would only need to pay a minimum fee for the services. So now, instead of a repaired windshield, we got a new windshield and we no longer have to worry about the stone chips getting bigger and presenting higher risks should we run into an accident. A white Christmas is a dream come true for someone like me who comes from the tropics. As an expat, I feel so lucky to live with my family here in Germany, where it really snows in the winter. I always feel delighted when we have snowfall. Although I am getting used to it, I sometimes wish I had a portable ariens snowblower with me each time I take my little girl to the Kindergarten to clear the way. It could really be difficult to tackle a soft snow-covered footpath especially if you are pushing a kid's stroller, and worse if you are going in the uphill direction. Yes, my little girl, although she loves the snow, prefers to sit in her stroller and be pushed rather than walking in it, thank you very much. But let it snow. This Christmas, I hope the heavens will let it snow. So that then, we could truly call our "first" Christmas here in Stuttgart a white Christmas, the ground covered with fine, white snow. And then perhaps, we can finally make a big snowman somewhere in the park or in the forest. Hihi! I hope everyone will have a happy and warm Christmas this year! As a child, I always find wonder and excitement whenever we put up our Christmas tree. I remember putting it up together with my siblings and parents and that feeling of wonder has stayed with me since then. Now that I am a mother, I too would like my little girl to experience that same kind of wonder and excitement that I felt while putting up the Christmas tree with the family. And I guess she did when we put up our first Christmas tree this year. It's nothing fancy like those you see on television and in home shops but it's something that we call our own. And the trinkets are small and my little girl put most of them up herself, one branch after another. She used a small ladder so that she could reach the higher branches, with Daddy gladly assisting her. It still doesn't have Christmas lights and we are going to put it up perhaps on the 16th, at the beginning of the novena de Gallo. How I wish I was able to take photos of her decorating our tree but I too was so busy handing her the Christmas balls and stars and little wooden toys that taking photos slipped off my mind. I so enjoyed watching my little girl enjoying putting up the tree that getting hold of the camera was the last thing on my mind. I guess the wonder of Christmas has never left me after all. And I all find it through the eyes of my little girl.